You say "Mais Non!" and I say "Mais Oui!" 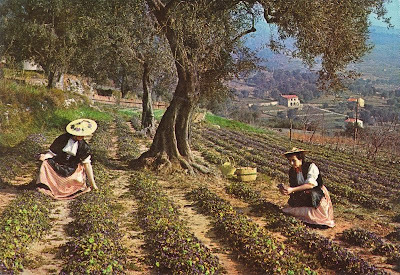 This postcard has the title: COTE D'AZUR - La cueillette des violettes à TOURRETTES-sur-Loup. To see the violet flowers under the olive trees you need to press and see the larger image. I have a dozen pictures from this set together in a box - each with bright sunlight and mediterranean colours - Cote D'Azure must mean Blue Coast. I would guess the postcard is from around 1970.